Hmm.. well firstly my boat is not wooden,but I couldn't find the weird boat projects category. 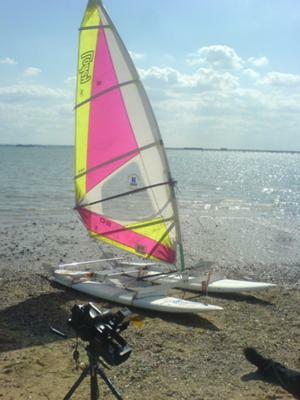 In fact my boat ,rather looks like two windsurfers going very fast have not seen each-other in time and have had the most horrendous crash. Planing on top of the water has always interested me,but planing has been rather overlooked when it comes to sail boats. And one day whilst looking at boat youtube videos I came across a design by Greg Mcgee. This got me looking at my 3 windsurfers that I had purchased for a totally different crazy idea,in a whole new way. After the idea had formed to a reasonable level in my head, I started visiting scrap yards for long bits of aluminium, and diy shops for nuts and bolts,and cake shops,,(i just love custard tarts),,anyway,,where was I,oh yes,,I made an aluminium frame,,stuck two windsurf boards on the bottom,,bolted a mast step on,,assembled the mast and 6 meter sail and boom,,stuck that on top,,,built two rudders from old dagger boards,,and linked them up together,,got some Ariel cable and used it as rigging. Took a big swig of Jack Daniels,,put it in the water,,jumped on it,,and blow me down with a custard tart,it worked,and in a 12 mph light breeze,got to 10 knots.